"I tell you, if any person stands before other people and is willing to say that he believes in me, then I will say that person belongs to me. I will say this before the angels of God. But if any person stands before people and says he does not believe in me, then I will say that person does not belong to me. I will say this before the angels of God." 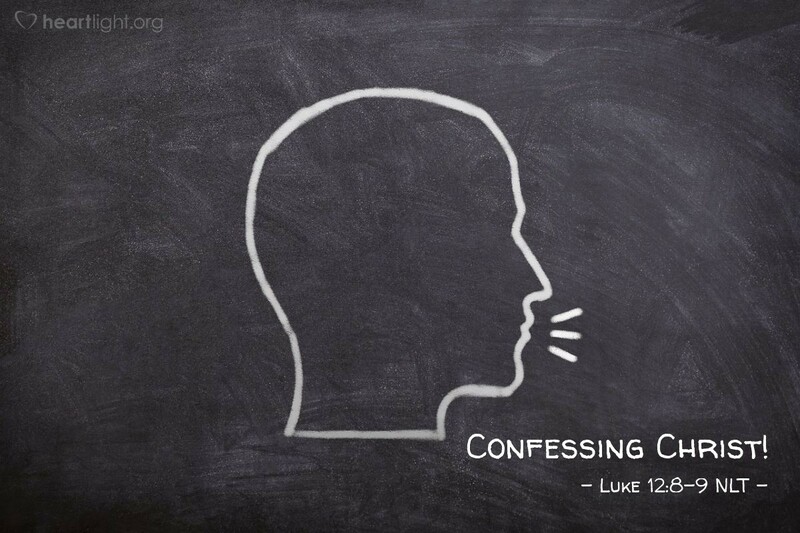 Confessing Christ is crucial! Confessing Christ can be costly in human terms. Christians in generations before us were sometimes put to death simply for saying, "Jesus Christ is Lord" rather than calling some other ruler "Lord." However, the significance of our confessing Christ is revealed most clearly by Jesus' own words here: he will claim us if we claim him! O LORD, my Father in heaven, you are holy. I know that just as I have acknowledged Christ as my Lord and called on his name in baptism, that Jesus will acknowledge me before you and the holy angels and will call my name as your child on the day he returns. Holy God, I gladly confess that Jesus Christ, your Son, is my Savior and my Lord. It is in his precious name that I am saved and that I pray. Amen.